Back in 2006, when a client & consultant came in and asked us to work together on a project for the City of London, we got really excited! And for good reason! We love the the square mile (that forms the centre of the oldest part of London), and as it is often overlooked (to a great extent) by visitors… this site set out to help change all that. Still going strong with a fully accessible site, solid CMS and great look… it’s a feather in the cap for us – from enhancing the concept & design, to contributing some great photography, to the site build, debugging, accessibility testing and so much more… it was a great pleasure to work with the smart people on that team. 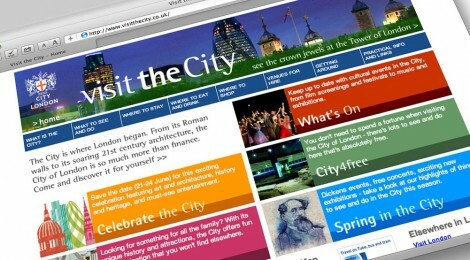 In 2012, the site’s content was integrated into the main site for the City Corporation of London. ← “The Offies” OffWestEnd.com London Theatre Awards celebrate the best and brightest!